I had a wonderful time at the recent Harrogate Crime Writing Festival. It’s been a few years since I attended and I was i mpressed by how much the event has expanded. 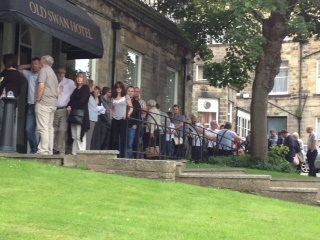 The picture to the right is of the queue for the Jo Nesbo event which stretched the length of the hotel and into the side garden. It was lovely to see old and new faces there, particularly Karen from Eurocrime who has written-up some of the excellent panels on her blog. I was lucky enough to have the opportunity to interview Camilla Lackberg while I was there. Lackberg is a hugely popular Swedish crime writer whose books have been translated around the world. As I know this blog is read by both crime readers and writers of the genre, I was hoping to gain an insight into both her crime reading, including her influences and also about the mechanics of her writing. 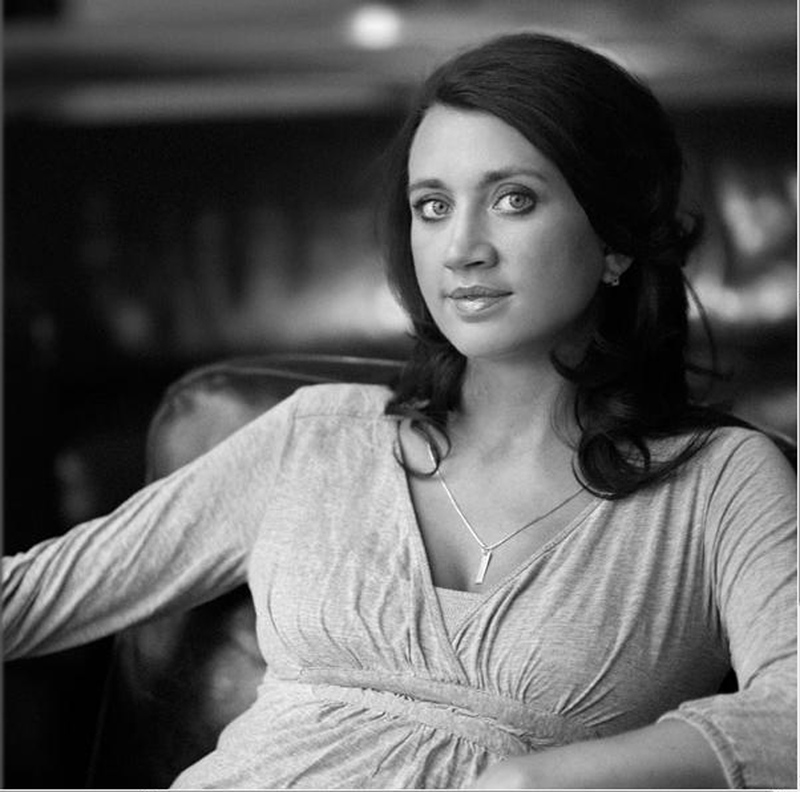 Sarah Ward: When I’ve attended author events over the years I notice that crime writers fall into two camps, those who love the genre and have read it all their lives and..
Camilla Lackberg [raises hand]. I’m an absolute crime nerd. SW: And who did you grow up reading? CL: My first encounter with crime fiction was Death on the Nile. I found it on my father’s bookshelf. He was a book worm and we always had tons of books in our house. I happened to stumble on that as I was reading adult books at a young age. I started with Agatha Christie and I just fell in love with it and went through the whole series. Then I read Enid Blyton and John Dickson Carr and then I moved on to other English crime writers and I just loved the genre. SW: Were there Swedish crime writers around that were similar to Agatha Christie that you could read? CL: I read a lot of Maria Lang. He books were set in a small town in the fifties and were really cute. There was also a guy called Steig Trenter who was well known in Sweden. So there were these cosy crime books and I read them all and loved them. SW: And do you think they influenced your writing? CL: They probably did and I usually say that I’m an old school crime writer. I consider myself old school in the way that the plotting itself isn’t very adventurous or inventive. I love the red herring and a set of people and the killer has to be one of them. You can’t introduce the murderer two pages before the end. There are certain rules that I believe in following so that’s the way that I consider myself old school. That’s probably because all that I read. It’s a little bit like the board game Cluedo. I want my books to be a little like Cluedo with the line-up of suspects but then what I think has created my unique type of crime books is the fact that I added this everyday life of a very normal couple that everyone can relate to and an everyday drama that most of us have been through – dating someone, getting married, having children and dealing with in-laws. We all have these things to deal with and we can relate to it. Most of us, however, have never been part of a crime investigation or seen a murder so that’s the extraordinary situation. So I mix those two things together. SW: I can see that when you plotted your first book you had the idea of mixing the crime story and the relationship aspect but I’m interested when it came to the second and later books what shaped the narrative. Is it the relationship that ends the previous book or did you decide I’m going to write a crime story and incidentally this happens to the relationships? CL: I plan the relationships more than than the crime plot. The crime grows organically as I write. I don’t know exactly how it is going to end but I know who the murderer is, the core of the crime plot but 95% of it grows as I write. But I do decide what is going to happen to Erica and Patrick, and Anna, but only one book at a time. I don’t have a ten book plan for them. SW: Do you think that there are any tensions between writing a series and also a self-contained crime story? CL: I don’t think so. I always wanted to write a series. I didn’t consider anything else as I love reading them. I base my decisions around what I love to read. I love series and I love when I find a new series that I haven’t read before. Also as a writer I think it gives you a great opportunity to develop the characters in a slow steady pace. If I’d only written one book about Erica and Patrick, I would have had to take them from A to Z much faster. Now I can let them grow really slowly and if you compare them now to the first book, they have changed as people. And I love that and it’s a great opportunity to write a series and I don’t think it confines me in any way. People sometimes say, is it really probable that so many get killed in Fjällbacka? Everyone in Sweden loves Midsommer Murders and so may people die in every episode. So you just have to accept it. SW: When you created your characters did you base them on anybody? I’m thinking of Melberg who is one of my favourite characters and gets nicer in the books. CL: From the beginning I wanted Melberg to be bad and him to be this humorous and burlesque character. I wanted him to be one dimensional but through the books he’s grown on me. I’ve discovered he has a nice side and there’s a heart to him with the grandson. He’s not the brightest police officer. When my first book came out I got e-mails for Swedish police officers asking if he was based on their boss. When I started writing Erica, I didn’t want her to be based on me so I made her five years older and I made her tall and blonde. But I discovered that I wrote so much better when I wrote about things that I had experienced and I lent that to Erica and we have grown closer. So I would say that she is 50% me and 50% her own person. We’re not identical. And Patrick is based on my ex-husband. SW: What about Anna? I found it quite difficult to read about her relationship with her ex-husband. Was it a conscious decision to put in the domestic violence? CL: It’s one of those things that upsets me. Conflict between siblings is a situation we often have in Fjällbacka as the houses are worth so much money. So siblings inherit from their parents houses bought for nothing and now worth £2 million and then they start fighting about it. Anna grew from thinking about what person would have a spouse who would make her go into conflict with her sister over it. SW: Have you been surprised about how successful you have been? CL: Yes. I thought my mother would be the only reader of my books, and other close relatives. I’m hugely surprised. SW: I’ve read that you feel that you feel that you personally put a lot of effort into making yourself successful. CL: I used to be in marketing so it was easy for me to use those skills in my own career and I’ve never seen a conflict in that. The first years I took beatings from that from within the literary world for talking about myself as a brand and being open about the fact that I market myself and that I want to sell books. I did every every interview imaginable. I did gardening interviews, car and cooking magazines. And it worked. And now I have a PR agent which is a little bit unusual. But I need someone to help me keep a focus in 55 countries. So I’m still active in working on my brand and I’m not ashamed of it. SW: Didn’t you do a dance programme? CL: Yes I did the Swedish version of Strictly Come Dancing. SW: I can’t imaging a British writer do this as they don’t have the same profile. CL: In Sweden authors are celebrities and have become so in the last five or six years. SW: How far did you get in the competition? CL: Fourth. It was seven hours a day training, seven days a week for fourteen weeks.It was really brutal. There are photos on my website. I’ve watched the series in Sweden so it was my big dream to be on there. SW: And what was your favourite dance? CL: The tango. We did the tango to Lady Ga Ga’s ‘Born this Way’. The outfits were flown in from a British company so it was feathers and sequins and my clothes got smaller by the week. Every Monday I was complaining that they looked more like bikinis. I said ‘Come on guys I’ve got three kids and I’m nearly forty.’ But it was fun. SW: And did you reach a new audience for your books? CL: I think I did. There were always people noticing me in the streets but there was a huge difference after the programme. Younger people who wanted my autograph. SW: Do you have any plans to do anything else? CL: I refuse to be put in a special box. I’m publishing my second children’s book in the autumn and I’ve written two cookbooks. I go by what I have a passion for. I did the Swedish version of ‘Who do you think you are?’ and I choose what I am interested in. SW: How do you see yourself as part of the Scandinavian crime juggernaut? Do you see yourself as a predominantly Swedish writer, or part of the wider Scandinavian crime phenomena? CL: Of course I identify with the Swedish crime community. We’re a tight knit group. I’m personal friends with Asa Larsson and Mari Jungstedt and we get together. But it’s great timing to be part of the wider crime writing community stating with Henning Mankell and then Steig Larsson. Especially in the States where it used to be impossible to be published but after Steig Larsson it’s completely different. SW: And do you work with the translators at all? CL: It varies from translator to translator. With Steven T Murray, he will e-mail questions. But not all translators do that. Only a handful. SW: What are your plans for the future. Do you have any ideas how many books you are going to write? CL: I’ve always said that I’ve no clue how many I’m going to write of the series and the only thing I know now is that I have two more in me and there might be no more after that, there might be fifteen. I can write them as long as I enjoy it and I feel that I have something to add to the story. SW: Can you say something about your writing schedule? Do you write every day? CL: I have periods of time when I write and I don’t do anything else. I don’t do interviews, I don’t go travelling, I just have to have months where I just write. I leave the kids at school and kindergarten and I treat it as office hours. It takes about eight months to write and I write from the beginning to the end and I don’t change that much. I’ve never changed big things to the structure so I deliver it quite finished. SW: It sounds like you are usually fairly happy with your first draft? CL: I don’t rewrite. I take time to get it right first time and I can move words here and there but I don’t rewrite whole paragraphs. I keep most things in my head. And sometimes when I’m halfway though the book I have all these strands in my head and I think oh my goodness, how will I ever make sense. And I have to have confidence that I will be able to finish this and tie all this together. I know from experience that I will be able to do so? SW: And has it got easier? CL: No. It’s like childbirth. I know how painful it’s going to be. I know how much work it will be and how much anxiety I will have. SW: Are there any writers coming out of Sweden that you can recommend? CL: Sofie Sarenbrant – I like the way she writes. What a great interview. She sounds so nice, and positive. I really liked reading about the way she writes her books & characters — and about the way she constructs her plots. Thanks Maxine. She was an excellent person to interview as she was so enthusiastic about crime fiction – both reading and writing it. Sarah – Superb interview! Thank you for sharing it. It’s so interesting to learn how authors put their stories and plots together. Thanks Margot. Yes it fascinating how writers put together their books together. Great interview. Lots of good questions and really useful answers. I mean, especially useful to people who try to write mysteries — her experiences with plotting, with not necessarily knowing exactly how the plot ends, and many other things. I like her frankness. Hope to read some of her work. Thanks for the interview, Sarah. Thanks Dorothy. If you are new to Lackberg you might want to start at the beginning to see how the relationships (which she mentions in the interview) develop. Looks like a fabulous event Sarah, and great interview! Thanks Sarah. The Strictly reference is fascinating isn’t it? I can’t imagine any British writer appearing on our version.